Crispin Howarth is the curator for Pacific Arts at the National Gallery of Australia. He is a previous president of the Oceanic Art Society and has travelled in the Ramu and Massim areas of Papua New Guinea to learn about the arts of these regions. 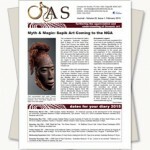 He has curated numerous exhibitions and published over 50 articles on Oceanic art including for the Masterpieces of New Guinea Art (Turvuren, Belgium), Oceanic Arts Pacifica (Casula Powerhouse) and Red Eye of the Sun: Art of the Papuan Gulf (San Francisco) exhibition catalogues. His main publications are the four exhibition catalogues Gods, Ghosts & Men (2008), Varilaku: Pacific Arts from the Solomon Islands (2011), Kastom: Art of Vanuatu (2013) and Myth + Magic: Art of the Sepik River (2015).